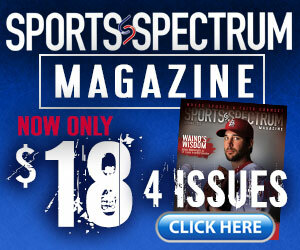 SPORTS SPECTRUM: Talk a little about your faith story and how you became a Christian. Aaron Craft: I had friend in high school that invited me to a bible study in junior high school, from there I started going to church with the girlfriend that I still have and from there I came to Ohio State and was really close to John Diebler and he introduced me to Athletes in Action and that’s kind of how, I’ve gotten to the point that I am now. SPORTS SPECTRUM: You’re involved with Athletes in Action on Campus, tell us a little about that. Aaron Craft: Yeah, it’s awesome. I actually live with two guys that I met through Athletes in Action right now and we just have a lot of fun. Monday nights, student athletes lead a Bible study, which is really cool hearing from one of your peers. And then Wednesday nights are weekly meetings for anyone who wants to come out. We average around 100 people, which is awesome. I get to emcee every once and a while, which is really cool, too. So it’s just a lot of fun. And it keeps me grounded and humbled amidst all the things that we have to do for basketball. SPORTS SPECTRUM: Compare playing basketball in front of 20,000 people to emceeing an event and sharing something personal like your faith in front of a smaller crowd. Aaron Craft: I’ve spoken quite a bit about my faith and other things (and) I’ve had some other opportunities since I’ve gotten here to OSU, and the success I’ve been able to have, for whatever reason, people want to listen to me talk. I don’t know if they’ll feel the same way after I’m done, but its always great to be able to do that and share just how God worked in my life to get me to the point that I am right now, it’s at times a little more nerve-wracking than playing basketball, just because I’ve been playing basketball for, I don’t know, 18 years now, just with the experience that comes with it, but I do enjoy it a lot. SPORTS SPECTRUM: Ohio State made it to the Final Four last year, before losing to Kansas, and this season you lose Jared Sullinger, what do you think you guys can do this year? Aaron Craft: Year to year, expectations don’t change. Coach (Thad Matta) does a great job of bringing in great players that can compete and play at the same level as those that end up leaving. So, all we know right now is we can focus on ourselves. There’s no great teams in October, so we’re taking it one game at a time, but at the same token, just keeping the bigger goal in mind, and that’s playing in March and playing in April. SPORTS SPECTRUM: And how difficult was it dealing with the loss to Kansas last season? Aaron Craft: In the moment, it’s really frustrating, really angry, especially when it’s just one possession, any thing can change the game. But I mean, looking back, we were one of the last four teams in America playing college basketball and that’s something to be proud of and something we were really fortunate to be a part of. SPORTS SPECTRUM: Your brother is in the Army and was deployed to Afghanistan last year during the NCAA tournament. How hard was is to deal with at the time? Aaron Craft: It was crazy. He didn’t want me thinking about it, he just wanted me to go out there and play my game. After the game was over, I knew that he knew that we were able to go to the Final Four, so that helped a lot. It just put things into perspective. We’re playing a game that seems like it means a lot. My brother, and there’s so many other people out there that are fighting for something that is a lot bigger than just playing basketball. SPORTS SPECTRUM: You were an Academic All American last year, how are you able to balance basketball and schoolwork? Aaron Craft: We definitely get a lot of help here. Anytime you need anything, as long as you’re willing to ask questions and search for the help, they’ll give it to you, which is amazing. I mean, I enjoy school, I would say I’m somewhat of a nerd so that definitely helps with performing well academically. SPORTS SPECTRUM: Talk about being a big man on campus and dealing with being recognized and the temptations that can come along with that. Aaron Craft: It’s weird, to be honest. I don’t know. It’s something that just kind of creeps up on you. And I remember coming here freshman year and making fun of John (Diebler) because everyone recognized him and knew who he was and now it’s kind of come to me and my other teammates. It’s just something that’s interesting that you just have to find a way to deal with. The biggest thing that helps me obviously is Athletes in Action and living with a group of guys that are kind of fighting the same fight I am and trying to live a way that I’m trying to live. And that helps a lot. Just to be surrounded by people that want the same things I do. SPORTS SPECTRUM: And is it tough making it to church during basketball season? Aaron Craft: It depends. Most of the time we get there just about every Sunday, but sometimes we may have practice during the middle of the day or things like that. There are definitely lot of options. There’s a church here that goes in the evenings, so that’s very helpful. SPORTS SPECTRUM: What is God teaching you right now? Aaron Craft: He’s probably teaching me, to believe in Him, and believe in myself, to not try and push too much. With the season coming up and with new things happening and expectations and all that, it’s really easy to get caught up in trying to force things and try and rush things and get outside of what I am and what I’m supposed to be doing. So just slowing down and relaxing and having fun playing the game of basketball, because that’s what it’s for in the long run. I don’t have anything specific. I do like to listen to any Christian contemporary music, or some Christian rap to get your mind in the right place. that always helps. Chris Tomlin’s my guy, Brandon Heath, MercyMe those guys. And in Christian rap, Lecrae, Trip Lee, KD and those guys. Wow, not a ton. Athletes in Action is the biggest thing that I do outside of basketball. I read on occasion, but not nearly enough. And that’d be about it. I would say the story of the rich young ruler in the gospels when he goes up and asks Jesus, “What do you have to do to get eternal life?” I really like that, I use that sometimes when I speak because I find some parallels between me and that rich young ruler in a sense. I was alright. I had some fun. I miss it sometimes, definitely being on campus here at Ohio State. I mean we’re a football school and it’s awesome to see how crazy these people get for a football game. No matter who we’re playing. At times I miss it, but how can I complain? I’m playing basketball at one of the best universities in the country, so you try to keep that in mind. I like to watch them all. Chris Paul and Steve Nash are probably two of my favorite. And Mike Conley, I have, kind of, a personal relationship with him since he comes back in the summer. It’s great to see those guys and see how they perform out there. Have you ever thought about growing your hair out like Steve Nash? Can’t do it. I’ve had the same haircut since I was a freshman in high school. And my girlfriend actually does it, or my mom, and it’s a money saver.